For many years, the family of William Scalf (son of Lewis) was very elusive and very little had been learned about this branch of our family tree. Although it had not been difficult to accept the belief that William Scalf was a son of Lewis Scalf due to census reports and various other records, it had been very difficult for researchers to track this family. With the help of the internet and various descendants of the Scalf/Scealf family, more information became available and we were finally able to find out more about the family of William and Susannah Scalf. In our search, we discovered that the spelling (or misspelling) of the name had been a major obstacle that had limited our information on this branch of the family. Once this was problem was solved we were on our way to finding descendants of this line and today, in 2013, we have discovered numerous descendants of William and Susannah Scalf. We have received much help in our search and for this we are extremely grateful. Along the way we have lost several members of the Scalf family. One in particular was Carol Waldroup who was very instrumental in finding the William Scalf family on the 1880 census of Georgia. Had Carol not diligently searched the difficult to read census records of 1880 and found the name spelled SKEALTS, we might never have been able to make the connection between SCALF and SCEALF. We lost Carol November 15, 2009 to bone cancer, but she will live on in our hearts and our memories, and her gracious contribution to this history will be appreciated for generations to come. This chapter will deal with information believed to be sufficient to support the names we have been able to compile concerning some of the descendants of William Scalf and his wife, Susannah. The main focus of this chapter is to take you through the existing evidence found to confirm the folks believed to be the descendants of William and Susannah Scalf, as well as to prove the SCALF/SCEALF family connection. As with any genealogy, a link must be found in order to confirm that different name spellings in the family were one and the same. This link is generally made with a Will but can also be made with various types of documents. From my experience in researching the Scalf family, I have found that our family either did not leave a Will, or the family member had lived in a “burned county” at the time of death. This has caused significant problems in connecting family members, especially in the very early years before the census reports listed the names of all the folks living in the household. It is believed by several descendants that William’s wife, Susannah, was Susannah Cash; however, it must be noted that the author has not found any evidence that would confirm or deny this at this time. Several other surnames have been suggested and speculated about, but no confirming evidence can be found to confirm her maiden name at this time. William (son of Lewis) and Susannah Scalf had at least two sons; Martin and William. It was with William’s son, William, that SCALF turned into SCEALF and he is known as William N. SCEALF. The middle initial in his name comes from a cemetery record of State Line Cemetery in Shellmound, TN. William was also found as William L. Scalf on some census records; however, the handwriting of some of the early enumerators left much confusion for researchers of any family; not to mention the many errors in ages. Whether the errors can be contributed to enumerators or persons giving information is unknown for certain, but if the reader has ever undertaken a family research then it is understandable how mistakes can be made in a family history. Martin Scalf was the oldest son of William and Susannah. From 1850 through 1880, census records indicate that Martin was blind. We assume that Martin was blind from birth; however, we cannot confirm this to be fact and recent information suggests that he might have become blind during his early years. Susannah, (aka Susan) the mother of Martin and William N. Scealf was living in the home of her son, William, on the 1870 Dade County, Georgia, census. Susan’s husband, William, was not found on this census and a mortality schedule reveals that William had died in December of 1869. William’s brother, Martin, was living next door to the family in 1870, but was in his brother’s home in 1880 Dade County, GA. There has been considerable confusion between the two William’s for researchers. The elder William was born 1780 and his wife was Susannah. The younger William was his son, born 1829 and his wife was Mary. The maiden name of both Susannah and Mary has not been verified at this time. It is reported that Susannah was Susannah Cash and Mary was Mary Turner; however, the author has not been able to verify either of these surnames at this time. However, descendants state that Mary’s maiden name was Turner and she will be listed as such in these writings. Due to the sparse records during the time of the births of these men, birth records cannot be produced for them. However, it is my belief that the census records from 1810 through 1940 will reveal enough supporting evidence to confirm that these men, William SCALF, William N. SCEALF and Martin SCALF were father and sons. To avoid confusion between the two William’s, identifying markers will be used. William Scalf (son of Lewis) will be listed as such and in various places might be referred to as William Sr. William N. Scealf will be listed as William N. Scealf (son of William) or the two may be listed as William (son of Lewis) and William (son of William). Links will be provided to supporting evidence when available. Errors may be encountered in the transcription of records and I make no claim that my transcription is error-free. I will welcome any notification of errors made by me in transcribing these records. We know that Lewis Scalf, father of William born 1780, was in Surry County, North Carolina in 1799 for he was taxed there in that year in Hudspeth’s district. This information was sent to the author by Koleen Moss, a Parker family researcher. Apparently, Lewis remained in Surry for a while, but several of his sons moved to Wilkes County by 1810. We believe that William was still in his father’s home in 1800. William (son of Lewis) first appears as head of house in Wilkes County, North Carolina in 1810; therefore, we can safely assume that he married 1800-1810, possibly in Surry County, although a search in the county does not reveal a marriage record. His first child is estimated to have been born 1800-1805. It appears this child may have been born before the move to Wilkes County; however, we are not certain when the move took place. 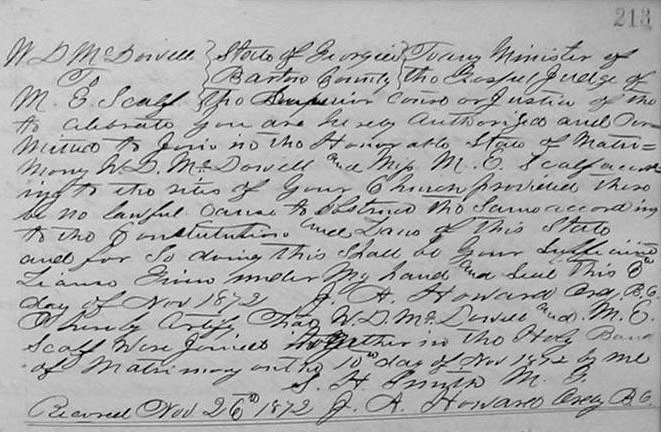 Lewis also witnessed a deed for land from James Bailey to Lodwick Coziah of Iredell County on November 17, 1799. This land was located on the waters of Dutchman’s Creek. 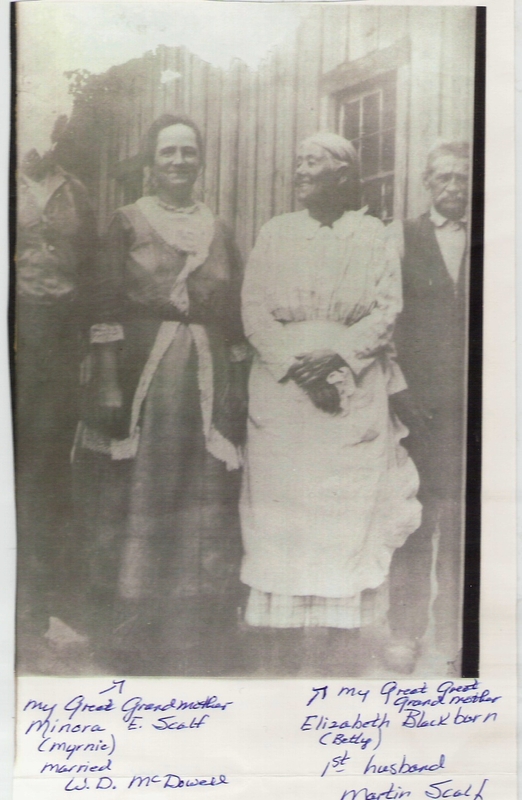 (Courtesy of Kolleen Moss) Lodwich Coziah/Keziah was a relative of Ceely Ann Keziah Scalf, wife of Benjamin. I have not examined these two tax lists at this time, but the tax list of 1799 has been confirmed by Kolleen Moss and we have a copy of that tax list verifying that Lewis was taxed in 1799 Surry County, NC. Lewis is then listed on the 1800 Surry County census. 1 free white male 16 - 25 1774 - 1785 David? The 1800 census of Surry County suggests that there might have been two sons born after Lewis married Elizabeth Blackburn. According to this census, two males were born 1784-1794 and we can assume that one son was William; however, we have not found any further evidence of another son and it is possible this was another family member in the home. The author has thought it possible that this might have been the Joseph Scalf found in Habersham County, GA drawing land in the land lottery, but no further evidence concerning Joseph Scalf in Habersham has been found after the drawing. Joseph Scalf in Habersham might also have been the Joseph Scalf that served in the Continental Line of the Revolutionary War and drew land in the lottery. If so, he was a cousin to Lewis Scalf. We know that Benjamin (son of Lewis) was born much earlier than 1774 and although other census records suggest David was born 1772, we believe this was David aged 16-26 in the home. We have no knowledge of any other sons of Lewis and Elizabeth other than John and William; however, there is the possibility there were others unknown to us at this time. My conclusion concerning the daughters of Lewis has been that at least one daughter, possibly Sarah, had already married by 1790. However, either daughter may have married first. Further research into Sarah’s history (if it can be found) might reveal this information. If William (son of Lewis) were head of house in 1805 he should have been listed on the 1805 tax list of Wilkes County, but Elmer does not mention this, and he was not found on the tax list that was examined by Kolleen Moss; therefore, we assume that William married 1805-1810. 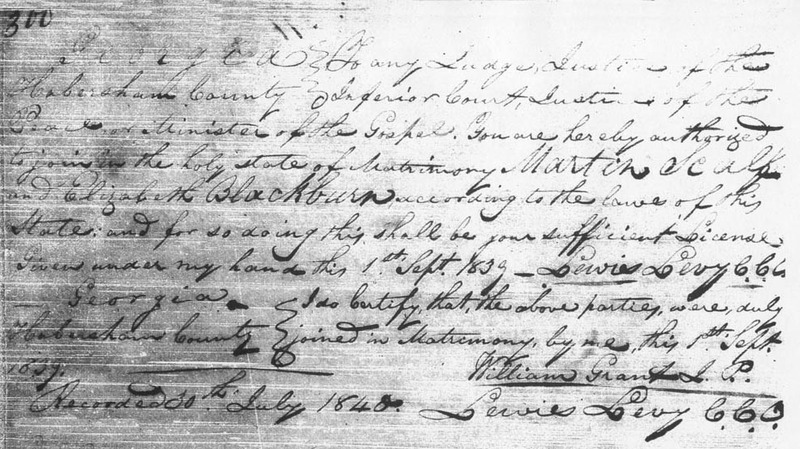 William then appears as head of house on the 1810 census of Wilkes County with Lewis living nearby. Note on the census of 1810 Wilkes County, NC, William’s estimated birth date is1784-1794; however, on other records the birth year estimates around 1780. Also, a William Blackburn is living nearby. William Blackburn was 26-45 estimating a birth year of 1765-1784. He might have been a relative of Elizabeth Blackburn Scalf. Interestingly, a William Blackburn appears in Georgia near the family later on. The records of Surry County, North Carolina reveal that John Scalf Sr. (son of Lewis) was still living in Surry County in 1805, but had left the area 1805-1810 and was found living in Floyd County, Kentucky by 1810. Considering the fact that Sarah (daughter of Lewis) is living in Surry County in 1812 after her father moved to Wilkes, suggests that she was married when the family moved over to Wilkes County and she remained in Surry County. No information has been found to suggest which Caps/Capps Sarah married, but a court record of Surry County does reveal that her married name was Caps/Capps. By 1820, William (son of Lewis) appears as head of house near his parents in Greenville County, South Carolina. This time the name is spelled SKELF. His father’s name is also spelled SKELF. This suggests that the enumerator spelled the name according to how it sounded to him, or in other words, he spelled it phonetically. The pronunciation of the name by William and Lewis, compounded with the phonetic spelling would seem to suggest this is where the problem with the spelling of this name began. This has caused much confusion for researchers through the years. The 1820 Greenville County, South Carolina is somewhat confusing concerning William Scalf/Skelf. On page 27, William is enumerated with two sons in the home and one son appears to be very young; however, on page 34 of this same census William’s family is enumerated again without the younger son. All other family members match the enumeration on page 27. We are left to wonder which enumeration is accurate. On page 34, William’s brother, David Scalf, is living three dwellings away from William. It is possible that the enumerator made a mistake in listing the younger son on this page, then corrected the mistake on page 34; however, we have no way of knowing if this is what happened. It is also possible that William moved after he was enumerated first and was enumerated again, but that would not explain the child missing on the second enumeration unless this child died. Although it is possible, it is not very probable that this happened. We do not believe this could have been the son William that was later enumerated in Habersham County, Georgia because this son was born 1825-1830 after the family had moved to Georgia. David Scalf (half-brother of William) is found living nearby and is listed as SCALF, but William and Lewis are listed as SKELF on this census. David left Greenville County, SC 1820 – 1830 and is living in Washington County, Tennessee by the enumeration of the 1830 census. William (son of Lewis) remained near his father until his father was no longer found on census records. William had two children on the 1810 Wilkes County, North Carolina census, a son and a daughter, both born 1800 – 1810. The son is probably Martin who is later found in the Habersham County, Georgia census records where his birth estimates to be around 1805-1806. According to the age listed on the census records of Georgia, Charity Scalf was born about 1801 and appears to be the oldest daughter and possibly the oldest child of William and Susannah Scalf. However, since William was not listed on the 1805 Wilkes County, North Carolina tax list mentioned above, it is doubtful that she was born 1801. The author believes she was born 1805-1810. Later records suggest that Martin was born 1806 and is very likely that Charity was born around 1808 since the early census lists both a daughter and son born 1800-1810. For the purpose of research, the descendants of the William N. Scealf line (Son of William) might pursue records on Sarah Turner living near the Scalf family in 1810 Wilkes County, NC. Descendants believe that William’s wife, Mary’s, maiden name was Turner; however, to my knowledge there has been no proof of her maiden name at this time. If Turner is correct, then Sarah Turner living nearby the family may, or may not, be a connection to William’s wife. As was stated earlier in the chapter, descendants list the name as William N. Scealf and this name appears on the headstone found by Charles Scealf, a descendant of this line. However, William N. Scealf was listed on at least one census as William L. Scalf. This may also have been a mistake concerning the enumerator’s handwriting. Please note that the birth dates on these census records have been estimated by me and were not listed on the original census records. The 1900 census record is the only census record that records the month and year of birth as given by the person submitting the information. I have estimated these birth dates on other census records only to show how the birth dates vary from census to census and to show the likely connections of family members. The last record of Lewis Scalf found in North Carolina is in the year 1812 when he appeared in the court of Surry County, NC concerning his daughter, Sarah Scalf Caps/Capps. Lewis, William and David then moved to Greenville County, SC by 1814 where Lewis purchased 50 acres of land in 1814. Lewis and his son, William, were then found in the Habersham County, Georgia census records of 1830. We believe Lewis and his son, William, left Greenville County, South Carolina together and moved to Habersham County, Georgia where Lewis entered and won as a fortunate drawer in the Georgia Land Lottery of 1832. Martin Scalf, son of William, was also a fortunate drawer in this lottery. Problems in tracking this line of the family begin in Habersham County, Georgia with the 1830 census, line #2, where William is found as head of house with the spelling listed as SCELTH. This is taken from the microfilm and it is possible that the (TH) might have been meant to be an (F) but it appears to be (TH). Possibly, the enumerator heard SCELTH when William or his wife pronounced the name, SKELF. Some folks still pronounce the name SCELF/SKELF instead of SCALF and I am assuming this is what happened here. Due to this spelling and the spelling of SKELF on the prior census, it appears that William pronounced his name differently than other family members. Reasoning for the belief that this is our William Scalf (son of Lewis) is the fact that he is found living near his father until his father dies. The age of this William also matches the age found on census records. After the death of his father, Lewis, William is then found living near his daughters and their families. Lewis is assumed to have died 1837-1840 in either Habersham or Franklin County, Georgia. We have been unable to find a death record for Lewis at this time; however, the patent for land that Lewis won in the Land Lottery of 1832 is dated 1843. Although Lewis was not found as head of house on the 1840 census or on any other records in Habersham County, Georgia, it is very strange that this patent was issued to Lewis Scalf in 1843. If Lewis was alive in 1843 when this patent was issued, he would have been 98 years old. However, a website on the internet states that fortunate drawers in this lottery were given five years to pick up their claims and a proclamation was issued giving them until spring of 1843. If this is correct, it is reasonable to assume that Lewis had died and another family member picked up the claim in 1843, which would have cost $18 for the 160 acres. 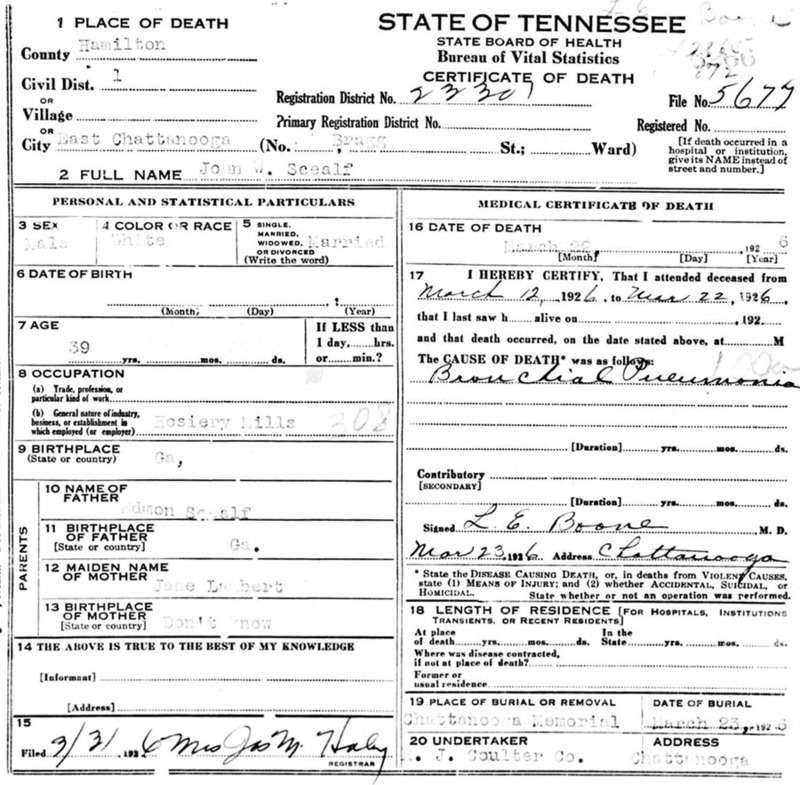 The statement made by Patsy Counts Scalf in the pension file of John Scalf Sr. from Hawkins County, Tennessee in 1845 confirms that Lewis Scalf died in the state of Georgia upwards of 100 years old. This would correlate with the age Lewis should have been in conjunction with the year this statement was made. This statement confirms that he had certainly died prior to the year 1845. If Lewis was born 1745 as his birth record states, and died 1837-1839, he would have been 93-95 years old, but if he was living in 1843 as the patent suggests, he was two years away from being 100 years old. In 1830 Habersham County, GA, William Scalf is head of house with four daughters and a son in the home. One daughter is missing from this census and the son on this census has a later birth date than on the 1820 census. Both William and his wife have a birth date now of 1780-1790, whereas William’s birth date is estimated several years later on prior censuses. Sarah, daughter of William and Susannah, married in 1828 and would not be listed on the 1830 census in the home of William. (1825 - 1830) William Jr.
(1780 - 1790) William Sr. Although the older son of William appears to be missing from this census, no other Scalf is found as head of house in 1830 Habersham County, GA. We believe the missing son was Martin Scalf. Martin might have been in the home of his grandfather, Lewis, on the 1830 census. There were a number of folks in the home of Lewis Scalf in 1830 that we have been unable to identify and one male correlates with the age of Martin on this census. A Hiram Forrester is living nearby William Scalf on the 1830 census and another marriage record states that Hiram Forrester married Miriah Louisa Scalf. The Hiram Forrester living near William Scalf is listed as 30 – 40 years old and has a female listed 20 – 30 years old. Their birth dates estimate at 1800 - 1810 and 1810 - 1820 respectively. However, this could not be the Hiram Forrester that married Miriah Louisa because Hiram and Louisa did not marry until 1845. Later, on the 1850 census of Habersham County, another Hiram Forrester and wife are listed. This Hiram Forrester is 26 years old and his wife is 25. They have three children with the oldest being born about 1845. This would most likely be Hiram Forrester and Miriah Louisa Scalf. William (son of Lewis) had five daughters in the 1820 Greenville County, South Carolina census. These daughters should have been; Charity; Sarah; Elizabeth; Mary (Polly), and Sydney according to the marriage records of Habersham County. Sarah would be gone from the 1830 census since she married in 1828. The rest would be in the home and the census of 1830 does show four daughters still living at home. The daughters still at home in 1830 should have been Charity, Mary, Elizabeth and Sidney. Miriah Louisa is listed as 25 years old on the1850 census with a birth date of around 1825. This suggests she would have been around 19 years old at her marriage according to this information. Elmer Scalf believed Miriah Louisa to be the daughter of Martin Scalf, son of William Scalf Sr. This is not likely since Martin did not marry until 1839 and Louisa married in 1845. Elmer states in his book that the Forrester family later moved to Fulton County, Arkansas. Going to the 1840 census of Habersham County, we find William (son of Lewis) listed as William SCELF. Living five doors away from William is the Asa Jones family. Asa married Mary (Polly) Scalf, daughter of William and Susannah Scalf. A John Forrester family is found here as well and he might have been a relative of Hiram Forrester who married Miriah Louisa Scalf. A young William Blackburn (20-30) is living nearby. Recall that an older William Blackburn is living near the family in NC. One researcher of the Forrester family relates that Hiram Forrester had a brother named John; however, John could have been the brother of the older Hiram Forrester found on the 1830 census since it appears there were two Hiram Forrester’s living in Georgia. A James Forrester is living near the Scalf family in 1830 and it has been stated that Hiram, who married Miriah Louisa, was a son of this James Forrester, however, we have no evidence to support this. (b) 1830 – 1835 William Jr. The 1840 census estimates the birth date of William (son of Lewis) around 1780 – 1790, and is consistent with the 1830 census; however, William’s birth date ranges 1784-1794 on prior census records. Recalling that William had one son and four daughters at home on the 1830 census, he now has two daughters and one son at home. William (son of Lewis) had two sons, Martin and William, according to census records. Martin had married the year before the 1840 census was enumerated and would not be the male listed on this census; therefore, we believe the son in the home was William N. Scalf. In fact, Martin was found as head of house in 1840. There were five marriages of Scalf females in Habersham County by 1840 and five daughters of William are now missing from the home. 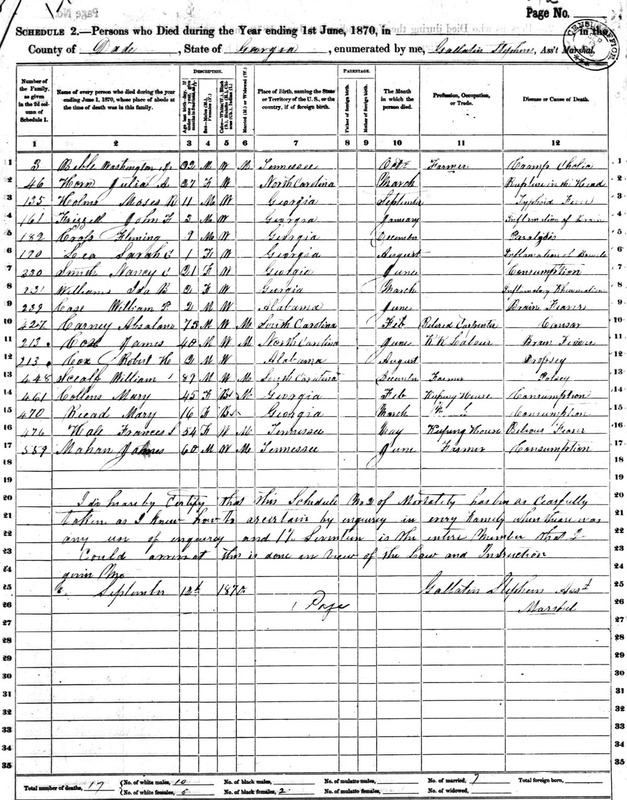 William N. Scealf (son of William) was the youngest son and should have been 10 – 12 years old on this census and is listed in the 5 – 10 column. He was probably around 10 years old here. The youngest female here suggests that William and Susannah had another daughter after their move to Georgia. The older daughter on this census is most likely Miriah Louisa who did not marry until 1845. The younger female in the home in 1840 was Nancy, a daughter born to William and Susannah after 1830. Elizabeth married in 1830, but did not marry until November of that year after the enumeration of the census. By 1832, Elizabeth had died and her husband, Charles Warren, then married her sister, Sidney, by 1833 which again correlates because Sarah, Elizabeth and Sidney had all married and would be gone from the home in 1840. Another marriage took place before 1840 between Charity SHELF and Silas Robertson in 1833. I believe this name to have been SKELF and was transcribed as SHELF on the online marriage records of Habersham County. The marriage record reviewed by the author is a transcribed copy. The original marriage record is being requested to determine if this was actually SHELF or SKELF. The (K) was often misinterpreted as an (H) in the early records. If this name is actually SKELF, a total of five daughters are gone by 1840. There were six marriage records found for six SCALF females in Habersham County, Georgia. William had five daughters married before 1840 and one after 1840, which is a total of six daughters. Below are the marriages listed in the transcribed marriage records of Habersham County, Georgia. 1) Sarah Scalf married David Highfield May 25, 1828. 2) Elizabeth Scalf married Charles Warren November 10, 1830. 3) Mary (Polly) Scalf married Asa Jones January 3, 1833. 4) Sidney Scelf married Charles Warren February 24, 1833. 5) Charity Shelf married Silas Robertson June 10, 1833. 6) Loyacy Scalf married Hiram Forrester in 1845. (Louisa Scalf). The youngest daughter, Nancy, was not confirmed until after this chapter was previously written. Nancy married Matthew Tindal or Tindle and this family moved to Alabama. In 1850, William and Susannah have their son, Martin, living in the home again. Martin had married in 1839 to Elizabeth Blackburn, but Elizabeth is not in the home. Martin is listed on this census as being blind. At first glance, one might think that the younger William in the home belonged to Martin; however, it is later confirmed on census records that Martin and the younger William were brothers. Several Scalf family members drew land in the 1832 land lottery. One was Joseph Scalf whom we have no further records on. This land was located in Walker County, Georgia. Quite possibly some of Lewis’ children bought the land from Joseph and Joseph moved on. It is also possible that Joseph died after drawing land in the lottery as he would have been quite old himself at this time, if this was the Joseph Scalf that was a cousin to Lewis. We have not been able to find any records of Joseph Scalf in Georgia other than the land lottery drawing and cannot confirm who this Joseph Scalf was. A good deal of movement transpired during the years 1850 – 1870 for the Scalf family before they finally settled in one spot and raised their families. Some family members moved to the Jackson/Dekalb County, Alabama area and later to Dade County, Georgia. Jackson County, Alabama was created in 1819 from Cherokee Indian Lands. This county is also located in the northeastern corner of the state and it is bounded on the north by Tennessee. The state of Georgia and Dekalb County, Alabama borders on the east and on the south by Dekalb and Marshall Counties. In reading the Jackson County, Alabama history it appears that coal mining and railroads were opening up in this area around the time William (son of Lewis) moved there and this may be the reason why William decided to try this area. He was surely a very healthy man to have been doing this type of work at 80 years old. William’s son, William N. Scealf, had married by this time and his family is also enumerated in the same household with his father. William N. Scealf (son of William) was listed as a “Laborer” as well. Susannah’s age is listed as 77 on this census and is most likely not correct according to other census records. Her birth date estimates to be around 1783 here but all other records indicate 1790-1800. Note that William (son of William) is listed as SCALF on both the 1850 and 1860 census records. William E. Scalf in the home of William and Susannah was the son of William and Mary and grandson of William and Susannah. Frances E. was Frances Ellen, a daughter of William and Mary as well. Living next door to William Scalf is William Warren who was most likely the oldest son of Charles and Sidney Scalf Warren. 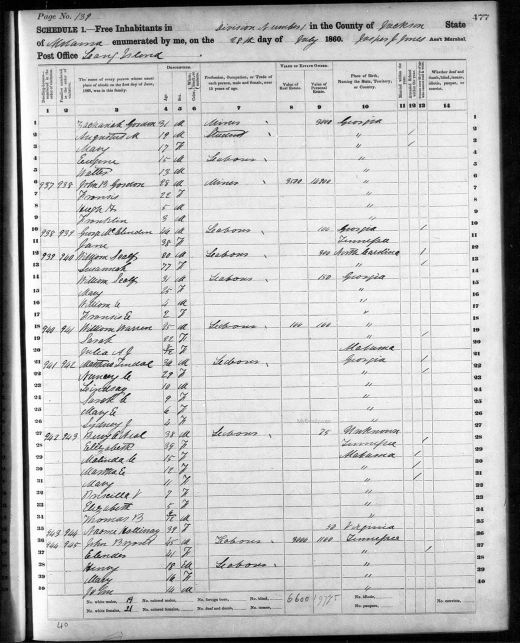 When William (son of Lewis) was found in Alabama in 1860, it was assumed he might still be there in 1870, but a search of this census year revealed he had moved on or had died. A search of the Georgia records was again undertaken and produced the family now living in Dade County, Georgia, but William (son of Lewis) was not among the family members. However, his wife Susannah was living in the home of their son, William N. Scealf. This census suggests his father, William (son of Lewis) had died either before the move to Dade County, Georgia or shortly afterwards, and the Dade County, Georgia Mortality Records revealed that William had, in fact, died after the move to Dade County, Georgia. Susannah, wife of William (son of Lewis) is living in the home of their son, William N. Scealf on the 1870 census and is listed as a widow. She is now 79 years old, which would be near her correct age according to most census reports. She was listed as 77 in the previous census but should have been around 70. Interestingly, all of William and Mary’s children have a birth place of Georgia on the 1860 and 1870 census records; however, by 1880, we find that some of the children of William and Mary were born in Alabama between 1861 and 1867 and this is probably correct. Also note that William is listed as William L. on the 1870 census. His brother, Martin, is living next door. William Scalf, son of Lewis, died in 1870 at the age of 89. Charles Scealf believes that William and Susannah could be buried at Stateline Cemetery; however, we have not been able to find proof of this. If they were, there is likely not a marker at their graves and we may never know where they are buried unless it is recorded in a book somewhere. Assuming that William (son of Lewis) had died since he was not listed on the 1870 census, the son William N. Scealf was the only means of tracking the family. A thorough search of the Georgia and Alabama census records did not reveal the family listed under the name SCALF - SCAFF – SCELF – SKELF – or SCEALF. However, Carol Waldroup undertook this tedious, eye-straining job of searching the Dade County census microfilm records to see if she could find any spelling closely related and fortunately for us, she did. Needless to say, I was delighted when Carol sent me the microfilm of this census. It was my opinion that the whole family had scattered to parts unknown in 1880 until Carol found this family listed under the name, SKEALTS. Until now, this family had been hidden under a spelling one would probably never have thought of. Carol spent hours going through these censuses looking at different names and I am very grateful for her help in finding this family. This find convinced me beyond a doubt that this name had been misspelled due to various reasons and not due to an intentional name change. I am convinced this is the same family all through these census records. If anyone can contribute anything to this information, I would like to hear from them and would welcome some input. The marriages of Habersham County record the marriage of Elizabeth Scalf to Charles Warren November 10, 1830. Charles E. Warren (1811-1898), a son of Notley Rueben Warren according to Warren family researchers, was born in Franklin County, Georgia, and was only five years old when his father died. In 1830 he joined the Mud Creek Baptist Church in Habersham County near Cornelia. Later that same year he married Elizabeth Scalf. Elizabeth died in 1832 after the birth of their only child, Reuben. Martin Scalf, son of William Scalf and Susannah, was born about 1805 or 1806 in North Carolina. Martin was blind but we cannot confirm that he was blind from birth; however, he is listed on the 1850 census and all census records following as “blind.” His blindness might have been a birth defect, or Martin might have been blind from an accident. Until further records can be found this cannot be determined. Martin’s parents were living in Wilkes County, North Carolina in 1810. The William Scalf family had moved to Greenville County, SC by 1820. Lewis Scalf left the Greenville County, SC area around 1825 and was found in Habersham County, Georgia by 1826. We believe his son, William, moved at the same time as his father, Lewis. Martin Scalf does not appear to be in the home of his parents, William and Susannah, in 1830 Habersham County, GA, but might have been with his grandfather Lewis Scalf. There are a number of people in Lewis’ home in 1830 that cannot be identified, but it should also be noted that Martin could have been with the Militia at this time. Martin is listed on a list of “Residents of Habersham County” that were fortunate drawers in the 1832 land lottery. Martin was living in Brown’s district in Habersham when he drew land in Cherokee County in 1832. Cherokee County was the original Cherokee Territory before becoming Cherokee County in 1831. Martin’s lot number was 62, in district 11, 2nd section of Cherokee County. Note that this record states “Cherokee, however, this appears to be the same land that Martin donated for the town of Ellijay, Georgia in Gilmer County. “In the writings of Thomas Harley Tabor, published in the Times-Courier Newspaper, Mr. Tabor mentions Martin’s lottery win. Martin gave a gift of 10 acres to the town to erect the courthouse of Ellijay, Georgia. This Cherokee land lottery and other interesting facts about Gilmer County, Georgia were documented by T. H. Tabor (Thomas Harley Tabor 1855-1926) and published in the Times-Courier Newspaper publication. Mr. Tabor describes how the lots were numbered and which direction they ran and in which districts. These lots were auctioned off in June of 1833; therefore, we know that Martin was blind in 1833 due to Mr. Ward’s statement. It is not very likely that Martin would have been a soldier if he were blind; therefore, we must assume that Martin met with some type of accident or illness before 1833 that caused his blindness. We know that Martin’s family was in South Carolina in 1820 and that his grandfather, Lewis, had arrived in Georgia by 1825. We can only assume that Martin’s father, William, arrived at the same time, but we do know he was there at the enumeration of the 1830 census. Things had begun heating up for the Cherokees by the time the family arrived in Georgia and Martin was likely a part of the local militia. All able-bodied men were required to serve in the local militia units and Martin would have been no exception unless he was physically unable. Whether this was how he became blind or not we will likely never know, but it is a consideration. These were very turbulent years in Georgia and Lewis and his family, along with other Georgia settlers, was undoubtedly hoping to find gold in Georgia. Time and again treaties had been made between the Cherokees and the U. S. Government only to be broken, and once again, after being told this would be their permanent home, they were forced to move again. The forced removal of 1838 otherwise known as, “The Trail Where They Cried” or as we more commonly call it, “The Trail of Tears” is an ugly scar on our American History, along with the brutal murders of Cherokee Chiefs Old Tassel and Abram under a flag of truce. In this same year, Martin Scalf acquired a horse to hold on a promissory note from Charles Parker. We do not know if Charles was a relative of Martin from his Aunt Penelope’s marriage to Joseph Parker, or simply a resident of Habersham; however, Charles apparently had borrowed money from Martin and had given him a horse to hold until the money was repaid. This indenture made this fifteenth day of July in the year of our Lord one thousand eight hundred and thirty four between Charles Parker of the County and State aforesaid of the one part and Martin Scalf of the other part Witnesseth that the said Charles Parker hath this day made and delivered to the said Martin Scalf a certain promissory note subscribed with his heirs and bearing even date with these presents whereby the said Charles Parker as aforesaid hath promised to pay the said Martin Scalf the sum of thirty dollars on or before the first day of Sept. next ensuring the date hereof for value received for and in consideration of the sum of thirty dollars by the said Martin Scalf to the Said Charles Parker in hand the receipt whereof is hereby acknowledged as well as for the better securing the payment of the aforesaid promissory note the said Charles Parker hath bargained & sold and do by these presents bargain and sell unto the said Martin Scalf his heirs & assigns a certain Iron grey colt To have and to hold said Colt as a aforesaid to have and to hold for himself his heirs and assigns to his and their own proper use benefit & behoof for ever - And the said Charles Parker for himself his heirs executors and administrators the said bargained colt as aforesaid unto the said Martin Scalf his heirs & assigns will warrant & forever defend against the Claim of himself and his heirs and assigns against the Claim of all other persons whatever. Provided nevertheless that if the said Charles Parker his heirs executors and administrators shall and do well and truly pay or cause to be paid unto the said Martin Scalf his heirs and assigns the aforementioned sum of thirty dollars on the day and time mentioned with lawful interest for the same according to the tenor of said note then & from thence forthwith as well this present indenture and the right to the property thereby conveyed as the said promissory note shall cease determine and be void to all intents and purposes. On the 1840 census report the name is listed as Martin SCAFF. A James Forrester is living next door. As Elmer stated in his book; “it is interesting and although we find it strange, Martin’s wife also had the same name as his grandmother, Elizabeth Blackburn Scalf” (wife of Lewis Scalf). The census record of 1840 reveals that a William Blackburn was living near the Scalf family in Georgia. It is unknown what, if any, his relationship might have been to Martin’s wife, or Martin’s grandmother, Elizabeth Blackburn Scalf. In 1839, Martin married Elizabeth Blackburn and they were found living in Huron or Heron’s District of Habersham in 1840. This is the only census that suggests that Martin and his wife, Elizabeth, ever lived together. Martin was found as head of house in 1860 with a female in the home, but this female was too young to have been Elizabeth Blackburn. It is unknown what happened to Martin and Elizabeth, but their marriage did not seem to last very long. By 1850, Martin had moved back home with his parents. Around 1846 Martin had sold all of his personal property along with his real estate property to his father, William, and by 1849 his father then sold all of this back to Martin. Martin stipulated in the deed to his father that his father was to take care of him as long as his father should live. This certainly appears to suggest that something had happened to Martin, but we know that he was blind in 1833; therefore, it isn’t likely that his blindness was the reason for Martin’s transaction. Martin had acquired a considerable amount of property and as most folks did at that time, he made several land transactions of various properties over a period of several years before he sold out to his father. It has occurred to the author that this might have been when Martin and Elizabeth split. In 1842, Martin sold to H. R. Cabarris in the amount of $200.00, ½ of Lot No. 150, in the 10th district of Habersham County, Georgia. The total acreage sold was 125 acres suggesting that Martin owned a total of 250 acres on this lot. This deed was made on the 13th day of January 1842 and recorded on March 23, 1842. Martin signed by mark on this deed and it was witnessed by H. B. Robertson and Milton Berry. Elmer Scalf stated that Martin sold the land he won in the lottery to B. L. Goodman; however, Martin donated 10 acres of this property to the people for the town of Ellijay, Georgia. He probably sold land around this area to B. L. Goodman. Although there were several land transactions in Habersham County, there were also a number of transactions in Gilmer County by Martin Scalf. The following deeds are transactions where Martin sold property in Habersham County, Georgia. The next two sales made by Martin strongly suggests that something had happened in his life because Martin then sold to his father not only his land, but all of his personal property. The above deeds confirm that both Martin and William were significantly wealthy for this time period. By the enumeration of the 1850 census, William’s family members at home are now named. This census also finds Martin back in his father’s home. Apparently, Elizabeth Blackburn Scalf and Martin were separated at this time for Elizabeth is not in the home with Martin. Note that Martin’s brother, William, is listed as W. S. on this census. It is the opinion of the author that the S. was intended to represent his surname and not a middle initial; however, this is only speculation due to the fact that William was later listed as William L. Scealf on the 1870 census and William N. Scealf on his headstone. Although it is stated on this census that Martin was born in South Carolina, in the home of William Scalf on the 1810 Wilkes County, North Carolina census, a male is listed as being born around the time of Martin’s estimated birth. Martin acquired a considerable amount of land on the French Broad River and according to the above deeds, Martin had lived on both the east and west sides of the Middle Fork of the Broad River. The writer mentions Minora and Jo. Minora was Minerva Elizabeth Scalf McDowell and Jo was Josephine Scalf Abernathy. Both are listed in the home of Elizabeth Blackburn Scalf in 1870, along with a son named William. At the time this email was received we were corresponding with a descendant of Minora (Minerva) Scalf McDowell. This was the first clue we had as to where Elizabeth might have been in 1850. We believe Elizabeth was the female in Martin’s home in 1840 after their marriage in 1839, but then Martin was back home with his parents in 1850 and Elizabeth disappeared. We then checked the 1850 census for a Tillman Brown and found a Tillman Brown in White County, Tennessee in 1850 with a wife named Elizabeth; however, there is no proof that this was Elizabeth Blackburn Scalf. However, this information is listed here in the event that someone can help us determine if this was the same Elizabeth Blackburn that was also married to Martin Scalf. Recall that Elizabeth’s birth date estimates at 1820-1825 on the 1840 census and she was 15-20 years old in 1840. It has been stated that Elizabeth was 18 years old when she married Martin Scalf. If this is correct, she would have been born about 1821; therefore, if this is Elizabeth Blackburn Scalf listed in Tillman Brown’s home in 1850, she would have been 11 years old when Richard Brown was born. Elizabeth, wife of Tillman Brown in 1850 is 33 years old according to the census and would have been born about 1817 making her 15 years old when Richard was born. If this was Elizabeth Blackburn Scalf, it appears that Tillman Brown was married prior to the marriage to Elizabeth. In the Habersham County, Georgia marriages is listed a marriage of Tilman Brown to Malinda Brown on December 24, 1829. This may, or may not, be the same Tillman Brown from the 1850 census of White County, TN; however, the marriage date of Tilman and Malinda Brown would coincide with the birth date of Richard Brown on the 1850 census. Also of interest in the Habersham County marriages is the marriage of John Blackburn to Frances Brown November 11, 1838, as well as William Blackburn to Emeline Grant April 2, 1839. Recall there was a William Blackburn living near William Scalf in 1840 Habersham County aged 20-30. This may or may not be the same William Blackburn. Although it might be merely coincidence, Martin Scalf and Elizabeth Blackburn were married by William Grant, J. P., in September of 1839. In 1843, Martin then sold 500 acres in Habersham County to a William Grant. Emeline Grant married William Blackburn in April of 1839. Martin also sold land to James Brown in 1846 and 1847 although James might simply have been an acquaintance; it is interesting that a Frances Brown married John Blackburn in November of 1838. There is nothing to confirm that any of these folks were related either by blood or marriage; however, it is food for thought since property transactions are sometimes made between family members. It is also interesting that Elizabeth Blackburn is thought to have married a Tillman Brown at some point, especially considering the land transactions between Martin Scalf and James Brown along with the marriage of Frances Brown and John Blackburn. There might not be a “smoking gun” here, but it is possible that the Brown and Blackburn families were connected. It would certainly be worthwhile to descendants of this line to research these names. A descendant of Elizabeth through her daughter, Minerva Elizabeth Scalf McDowell, corresponded with another researcher that also had a letter written by the granddaughter of William and Minerva Scalf McDowell (daughter of Elizabeth Blackburn Scalf). In this letter the granddaughter states that both her grandmother and great-grandmother were believed to have been of Cherokee descent. If this is the same Elizabeth Blackburn Scalf mentioned above, she might have been the daughter of Lewis Blackburn. We do know that Lewis Blackburn had a daughter named Elizabeth, but whether she is the Elizabeth Blackburn that married Martin Scalf is undetermined at this time. However, it should also be noted that there was more than one Elizabeth Blackburn and more than one Lewis Blackburn. Elizabeth had a daughter named Josephine and listed as Josephine Scalf in 1870. There was also more than one Josephine Scalf/Skelf. More research is needed on these families in order to sort out exactly who this Elizabeth Blackburn was and if she was the daughter of Lewis Blackburn. It should also be noted that the Cherokee were not from Pennsylvania. Although they were certainly in that area at various times, to my knowledge they had never lived there. Although I have not researched this information, it has been stated by others that Lewis Blackburn married Mary Daniels and Mary is alleged to have been a mixed blood Cherokee Indian. Sometime around 1858 or 1859, William and Susannah moved to Alabama. Martin Scalf, son of William and Susannah, did not make the trip to Alabama with the family but remained in Georgia where he is found as head of house in Cass County. Cass County later became Bartow County. Again, Elizabeth was not found with Martin in 1860, but it is interesting that Martin was living in Cass County in 1860 and Elizabeth is head of house there in 1870 after it became Bartow. In 1860, a female is listed in the home of Martin Scalf and at the first posting of this chapter, it was assumed this was a second wife of Martin; however, we have not found any information to suggest that Martin had remarried at this time, and due to the fact that her initial is “M” it is possible this was Minerva “Minora” Elizabeth Scalf; however, the age is off considerably, which only adds to the confusion. The 1870 census suggests that Minerva “Minora” was born around 1856 and the female in Martin’s home in 1860 was born around 1840. It is possible that this is a daughter born earlier than Minerva “Minora” that happened to have the same initial as Minerva “Minora.” The estimated birth date of this female does coincide with the marriage date of Martin and Elizabeth. There might also have been more children born 1840-1850 that we have not found. It is also a theory that this was Elizabeth Blackburn using the initial of her first name; however, the birth date is too far off from Elizabeth’s birth date to have been her, unless there was a mistake made on the record, which would not be at all impossible. We have no information on G. Payne at this time. Elizabeth Blackburn Scalf could not be found as head of house in 1860. The only Elizabeth we could find in 1860 that might fit the age of Elizabeth Blackburn Scalf was found in Florida living with a John and Sarah Williams, but her name is now listed as Elizabeth BLACKBURN. Whether this is our Elizabeth Blackburn Scalf or not cannot be confirmed. Note that Sarah Williams’ birth date estimates to 1841 and she was born in Georgia, only two years after the marriage of Martin and Elizabeth. This may or may not be part of the family of Martin and Elizabeth, Blackburn Scalf; however, this is added for the benefit of future research. By 1870, Martin Scalf (son of William and Susannah) was living next door to his brother, William N. Scealf, in Dade County, Georgia. Elizabeth Blackburn Scalf was living in Bartow County, GA (previously Cass Co.) at this time. It also appears that Martin and Nancy did not live together very long for in 1880 Martin is once again living with his brother, William, in Dade County and Martin does not have a wife in the home at this time. The name now appears to be SKEALTS on this census. Martin was not found after the 1880 census and we assume he died before 1900 since he was not found in 1900. A Nancy Scalf was found living in the home of Frances Campbell in Polk Co. GA in 1900. We have not been able to place this Nancy Scalf with any other family and it is assumed that this was Nancy Laney Scalf. The word “Unknown” has been abbreviated on this census by the enumerator as UN. The name Stenns might have been Starnes or Stems, but it appears to be Stenns. Nancy stated that she had three children with three living. Frances was a female and a daughter of Nancy. This may, or may not, be Nancy Laney Scalf. Her age is about four years off from the 1870 calculation, but this is insignificant. Nancy was not found after this census and assumed to be deceased. Note that Josephine, daughter of Elizabeth on the 1870 Bartow County census was born about 1853. Although it is possible that Martin and Elizabeth remained married and had contact with each other, Elizabeth was not found with Martin after 1840. It was also stated that Elizabeth Blackburn married Tillman Brown at some point. We cannot verify that Elizabeth with Tillman Brown in 1850 White County, TN is the same Elizabeth Blackburn that married Martin Scalf. The fact that Elizabeth is still using the Scalf name in 1870 is very confusing if she had in fact, been married to Tillman Brown. The young Elizabeth Scalf in her mother’s home in 1870 and Manary from the 1880 census is the same person. Manary was a transcribing error for Minora who was actually Minerva Elizabeth Scalf, believed to have been the daughter of Martin Scalf and Elizabeth Blackburn Scalf. 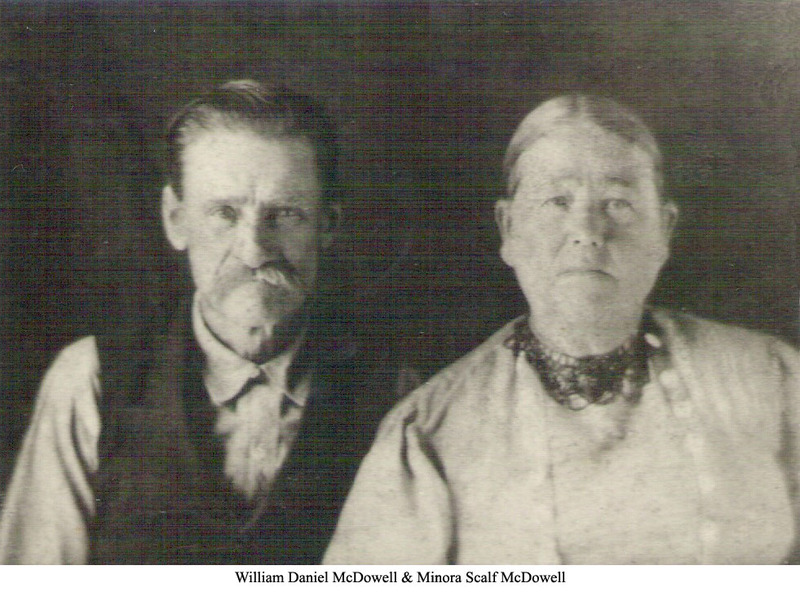 Minerva “Minora” Elizabeth Scalf married W. D. McDowell. Although census records sometimes list her as Minora, she is listed on her marriage record as Minerva. We cannot determine at this time if this was an error by the marriage clerk or an error by the census enumerator, or if Minerva was actually her name. Elizabeth Blackburn Scalf is living in the home of W. D. (William Daniel) McDowell in 1880 Bartow County, Georgia. The enumerator marked the column divorced/widowed; however, he does not stipulate which. However, we know that Martin was still living at this time. The enumerator marked Martin as “blind” twice on the 1870 census but did not mark whether he was single, divorced or widowed. This was also not marked for Martin in 1880. It is very possible that Elizabeth was divorced and widowed. She could have been divorced from Martin and married Tillman Brown who was deceased. This was the last time we were able to find Elizabeth Blackburn Scalf. Records are confusing concerning Martin and Elizabeth Blackburn Scalf. We know from their marriage license that Martin and Elizabeth did marry in 1839 and the 1840 census does reveal that a female was living with Martin and this female is assumed to be Elizabeth Blackburn Scalf. After 1840, Elizabeth is no longer found with Martin. It is then reported that the same Elizabeth Blackburn that married Martin Scalf might have married Tillman Brown. The fact that Martin sold everything he owned to his father in 1846 and then bought it back in 1849 suggests something had happened in Martin’s life at this time. What is most confusing is the fact that Elizabeth had three children in her home in 1870 listed as SCALF; however, these children were born beginning in 1853. The fact that her children were born after 1850 also adds more suspicion to an already complicated story. If the ages and estimated birth dates of these children were correct, this suggests they were children of Tillman Brown and not Martin Scalf, unless Martin and Elizabeth had gotten back together 1850-1853 and had the three children. It also appears that M. Scalf born about 1840 and living with Martin Scalf in 1860 Cass County, GA might have been a child of Martin and Elizabeth, as well as Sarah Williams born about 1841 and living in Florida with her husband, John, in 1860. The Williams family might not be related at all to Elizabeth Blackburn Scalf; however, this would certainly be an avenue for research into the children of Martin and Elizabeth Blackburn Scalf. Josephine Scalf, presumed daughter of Martin Scalf and Elizabeth Blackburn, was born November 1853 and died April 1, 1925 from mitral insufficiency of the heart. Josephine married Silas M. Abernathy on November 27, 1870. Silas was a Civil War Veteran and served two tours in the Army. He enlisted April 10, 1865 in Company D, 49th Regiment of Indiana State Volunteers and was discharged September 13, 1865 in Indianapolis, IN. Later, Silas enlisted again on July 29, 1867 and was assigned to Company G, 33rd U. S. Infantry. He was discharged July 27, 1870. Silas Abernathy died January 18, 1906. Silas and Josephine Abernathy received pensions. Interestingly, Josephine named a son Tillman. 1) Minnie Abernathy - born October 1, 1871 in Cartersville, GA; married Joseph Larkin Alexander. 2) Della Abernathy - born April 18, 1875; married John Henry Coleman November 1, 1891. John Coleman was born August 31, 1871. 3) Tilman Alvin Abernathy - married Mary J. George. 4) Bersha Ola Abernathy - born December 24, 1886 in Dallas County, GA. Sometime during the 20-year span between the 1880 and 1900 census, Silas and Josephine moved from Georgia to Alabama. On the 1900 census, Silas and Josie stated they had been married for 29 years and had 7 children born with 6 living. By 1910, Silas had died and Josephine was head of house. She stated she was a widow with 7 children born and 5 living. One child had died since the enumeration of the 1900 census. Her son, Tom, was living in the home and was married. He stated he had been married 2 years with 2 children born and both were living. His wife’s name appears to be Marnie on the census but this was probably Mamie. Although Tom and his wife stated they had 2 living children, only Lusile (Lucille) is listed and she is one year old. The other child is Clifford Young and Clifford was six years old. It is possible the enumerator made a mistake on the number of children for Tom and his wife. Arthur Frissell was living in the home as a boarder on this census. We do not know if there was a relationship of Arthur to Josephine’s family. In 1920, only Josephine and her daughter, Bersha, were in the home. Minnie Abernathy, daughter of Silas Abernathy & Josephine Scalf, was born October 1, 1871 in Cartersville, GA. Minnie married Joseph L. Alexander. We do not have a marriage date for Minnie and Joseph; however, they had been married 11 years in 1900 and this calculates a marriage date of 1889. Minnie and Joseph stated they had 3 children born with only 1 living. By 1910, Minnie and Joseph stated they had 7 children born with 4 living. By 1920, Minnie and her family had moved to Panama City (Bay Co.) Florida. J. F. Forester was boarding in their home and was probably a cousin to Minnie. Alexander and Minnie were still living at Panama City, Florida in 1930 and 1940. Lynford O. Abernathy, daughter of Silas Abernathy and Josephine Scalf, was born April 18, 1875 in Georgia and died September 10, 1956 in Jefferson County, Alabama. Della married John Henry Coleman November 1, 1891. John Coleman was born August 31, 1871. In 1900, John and Della had 3 children born with 3 living. By 1910, John and Della had 6 children born with 4 living. Between 1910 and 1920, Leroy (Roy) had married and was widowed in 1920. We were unable to find this family in 1930, but they were found again in 1940 in Jefferson County, AL. Tillman Alvin Abernathy, son of Silas Abernathy and Josephine Scalf, was born about 1879. He was living with his sister and brother-in-law in 1900. Tilman had married by 1910 and was head of house in Etowah County, Alabama. We do not have the maiden name of Tilman’s wife. Tilman had a step-son, A. V. Young in the home in 1910. 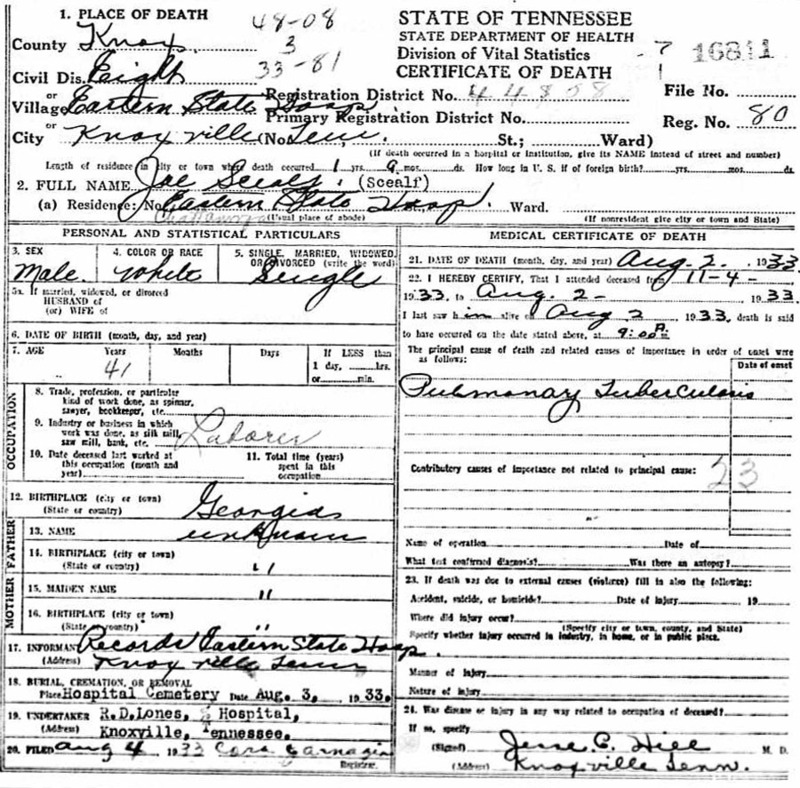 Either Mary had died, or they had divorced for Tilman then married Clara L. Harwell in Bay County, Florida in 1927 and had moved to Montgomery County, Alabama by 1930. His sister, Bersha (Bershie) was in the home with them in 1930. 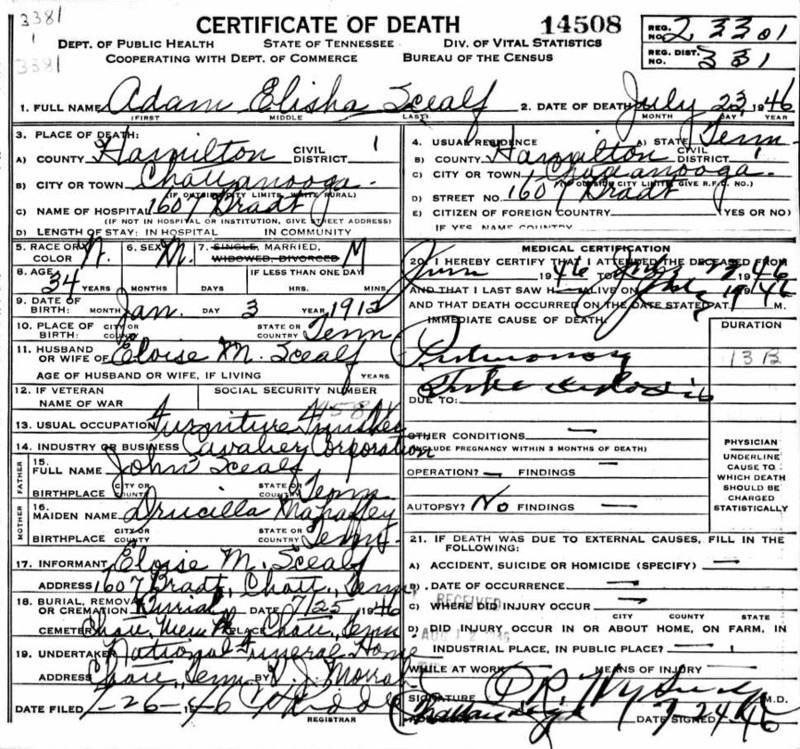 Bersha Ola Abernathy, daughter of Silas Abernathy & Josephine Scalf, was born December 24, 1886 in Dallas County, GA. According to the information contained in several affidavits that were sent to the State of Alabama Department of Veterans Affairs, Bersha was mentally and physically handicapped. She stayed with her parents until they died. Bersha is living with her brother, Tilman, and his family on the 1930 census. Later, in the 1930s, she moved to the home of her sister and her husband, John and Della Coleman. Since Silas Abernathy, the father of Bersha Abernathy, served in the Civil War, John and Della applied for a pension for Bersha but the application was denied because Bersha was over 16 years of age when Silas Abernathy died January 18, 1906. Thomas William Abernathy, son of Josephine Scalf and Silas Abernathy, was born about 1883-1887according to census records. In 1910, Thomas was living with his mother and sister at Gadsden, Alabama. 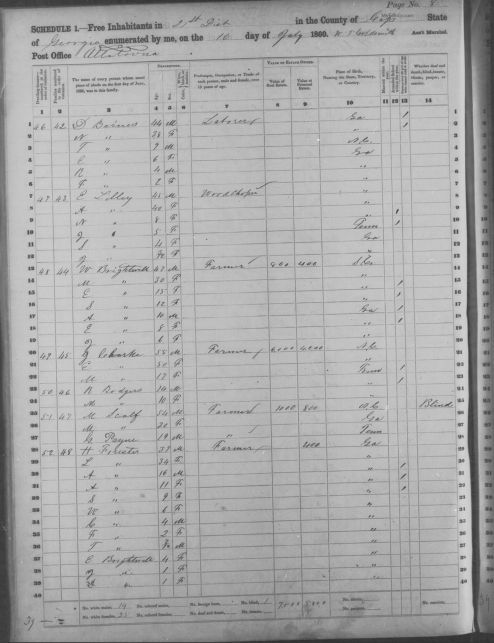 The initial on this census for his middle name appeared to be a B., however, his name was Thomas William. Sometime between 1910 and 1920, Thomas married Arrilla ______. Her maiden name is unknown at this time. We have found only three children at this time. This family lived in Gadsden, Alabama through 1930 and might possibly have remained there. We have no further information on this family. Something happened to the family unit of Martin Scalf after 1840 for he was head of house in 1840 and it appears his wife, Elizabeth Blackburn Scalf, was in the home; however, Martin was living with his parents again in 1850 and Elizabeth was not found as head of house or with Martin. By 1860, Martin is head of house again and a female with the initial M. was living in the home along with a G. Payne. However, we cannot determine who these folks might have been. In 1880, Elizabeth Blackburn Scalf is living with her daughter Minerva and family. Minerva’s name has been misspelled on census records as Manary and Minora as well as other misspellings; however, her marriage license lists her name as Minerva. It is not clear why John E. McDowell is listed as head of house on the 1900 census. It is possible the enumerator heard the wrong name or a relative, brother or cousin, is living with the family. It appears the family is migrating west since they are living in the state of Arkansas when the next census is taken. The census does state that the couple was married although the marriage license states her husband’s name as William. By 1910, William and Minerva had moved to Washington State. Dewey and Arthur Hamilton were children of Ida, a daughter of William and Minerva. Ida was not in the home in 1910, but we assume she was living somewhere else for she did not die until 1950. By 1920 William and Minerva are back in Etowah County, Alabama. 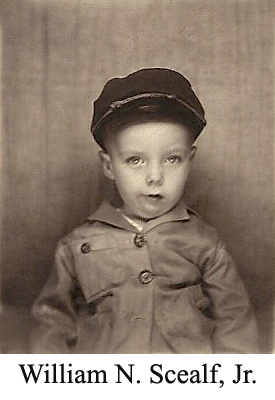 Felix McDowell, son of William McDowell and Minerva E. Scalf, was born January 23, 1878 in Cartersville, Bartow County, Georgia and died November 14, 1954 in Zephyrhills, Pasco County, Florida. He married Margaret Edith Shearer in 1937. William Riley McDowell, son of William D. McDowell and Minerva E. Scalf, was born September 26, 1875 in Georgia and died August 15, 1966 in Goldendale, Klickitat County, Washington. He married Daisy M. McDowell. Ida Elizabeth McDowell, daughter of William D. McDowell and Minerva Elizabeth Scalf, was born October 17, 1879 in Cartersville, Bartow County, Georgia and died January 26, 1950 in Clatsop County, Oregon. Ida married William Hamilton on August 1902 in Vancouver, Clark County, Washington. It is difficult to determine which of William and Susannah’s daughters was the oldest due to the variation of their estimated birth dates from census records; therefore, the children of William and Susannah Scalf may not be listed in correct birth order. Sarah Scalf, daughter of William and Susannah Scalf, was born 1810-1815 according to census records. The marriage records of Habersham County record the marriage of Sarah Scalf to David Highfield on May 25, 1828. David Highfield is found living next door to William Scalf (son of Lewis) on the 1830 census of Habersham County, Georgia. We first find the David Highfield family on the 1830 Habersham County, Georgia census. One son had been born at this time and due to the marriage date he was likely born around 1829 or 1830. This appears to have been Benjamin. By 1840, David and Sarah were living in Jackson County, Georgia. They now have three sons and three daughters. In 1850, David and Sarah are living in Cherokee County, Georgia. They have six sons and three daughters. 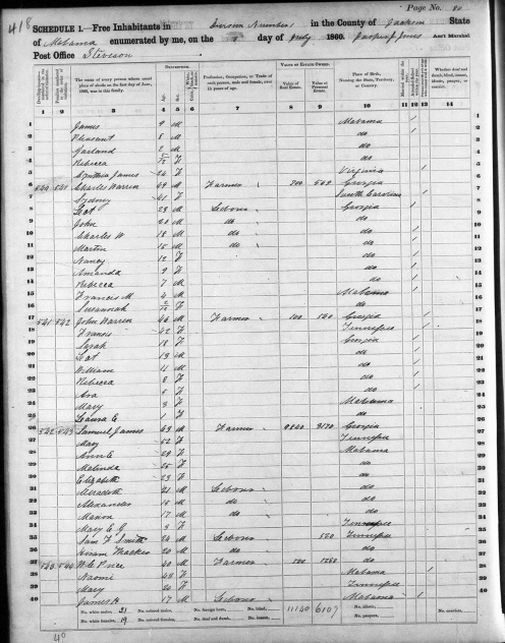 The David Highfield family was living in Cherokee County, Georgia when the census was taken on November 8, 1850. During the next few days, the family moved to Jackson County, Georgia and was counted again. They had lived in Jackson County in 1840. However, their daughter, Mary, did not make the trip to Jackson County, Georgia. Mary might have died between 1840 and 1850 or she might have married at this time. During the next ten years, something must have happened to the David Highfield family. Of course, the older children married and moved away from home. However, after 1850, David and Sarah Scalf Highfield cannot be located. However, in the 1860 Tishomingo County, Mississippi census, there is a Milton and a John Highfield living with two different families. They match up to the youngest children of David M. Highfield. Milton is living with Rebecca and Archibald Norris, a couple in their 60's, and John is living with Caroline and Green Hubbard. Caroline appears to be the daughter of David M. Highfield and Sarah Scalf. It is possible that both David and Sarah had died and the younger children were forced to live with other families, or David died and Sarah had remarried. We do not have information on all of the children of David and Sarah Scalf Highfield at this time; however, the information on the children we have will follow. William Highfield, son of David Highfield and Sarah Scalf, was born about 1837. (1860 Census) William was living in Franklin County, Alabama in 1860. No further information on William. 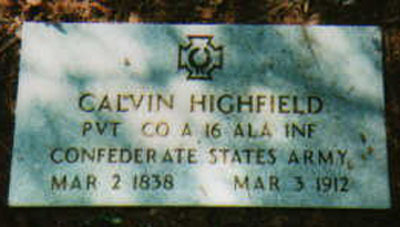 Caroline Highfield, daughter of David Highfield and Sarah Scalf, was born about 1832 in Georgia. She married Green Hubbard. They were living in Tishomingo County, Mississippi in 1860. No further information on this family. Milton Monroe Highfield, son of David Highfield and Sarah Scalf, was born about 1847 (1860 Census). Milton was living in the home of Archibald Norris in 1860 Iuka, Mississippi. We have no further information on Milton. John Highfield, son of David Highfield and Sarah Scalf, was born about 1845 (1860 census). John is living in East Port, Mississippi with his sister, Caroline Highfield Hubbard, in 1860. John's brother, Milton Highfield, was living in Iuka, Mississippi which is about five miles from East Port. Sidney Scalf, daughter of William and Susannah Scalf, was born about 1813 according to census records. The marriages of Habersham County record the marriage of Elizabeth Scalf to Charles Warren November 10, 1830. Elizabeth was a sister to Sydney. Warren researchers state that Elizabeth died after the birth of their child, Rueben, in 1832. We have been unable to confirm or deny this information; however, Charles did remarry to her sister, Sidney Scalf, in 1833. A marriage record of Habersham County lists the marriage of Charles Warren to Sidney Scalf on February 24, 1833. In the 1850 census, Linda is listed as the wife of Charles Warren. However, Linda may be another name used by Sidney since the initials of the children in the home match the names of the children of Charles and Sidney Scalf. Sidney then appears on the census of 1860; therefore, we believe the enumerator made a mistake on the 1850 census when he listed her as Linda. A search of the 1860 Jackson County, Alabama census reveals that Charles and Sidney Scalf Warren were living in the Long Island Community, Division #1 in 1860. Charles and Sidney remained in Alabama where they raised a large family before they died. The Warren family remained in Alabama for quite some time for they were found again in 1870 living in Jackson County. In 1860, John Warren is living next door to Charles. This was a brother of Charles according to descendants. We find that Sidney has another name in 1870. She is now listed as Isabella. According to the ages and the names of the family members on this census, we are sure this is Charles Warren and wife, Sidney Isabella Scalf. John Warren is listed on the 1860 census as 20 years old and a John W. Warren is listed on the 1870 census as 6 years old. This is most likely a grandson on the 1870 census. By 1880, Charles and Sidney are in Dekalb County, Alabama, next door to Jackson County. Dekalb County was created in 1836 from land ceded to the Federal government by the Cherokee Nation. This county is located in the northeast corner of the state. It is bordered on the north by Jackson County, on the west by Marshall County, on the south by Etowah and Cherokee counties, and on the east by the State of Georgia. Fort Payne is the county seat. Warren researchers state that Charles and Sidney lived for some time on Sand Mountain near Chattanooga, Tennessee. Charles and Sidney might have gone to Dade County around 1840 or 1850 and then to Jackson County, Alabama by 1860. Coal mining was a drawing source in both areas. Charles and Sidney are found in the 1880 Dekalb County, Alabama census. Living next door to Charles Sr. is his son, Lot Warren, and next door to Lot is his brother, Charles Warren Jr.
For those interested in researching this line of the Warren Family, a considerable amount of information can be obtained from the Warren Family Genforum; message numbers 4519 and 4524. Mary “Polly” Scalf, daughter of William and Susannah Scalf, was born about 1820 (Census records) and died 1860-1870. The Asa Jones family is found in 1840 living in Habersham County, Georgia near William Scalf. As listed above, Mary “Polly” Scalf married Asa Jones January 3, 1833 in Habersham County, Georgia. The Asa Jones family is living in District #18 of Habersham County in 1850. The enumerator did not write out the names, but used initials instead. It is difficult to read this census with accuracy. The numbers listed on this census for ages suggest two sets of twins. However, by 1860, the census is somewhat clearer and we now have names instead of initials. Polly is now listed as Mary. Polly was a commonly used nickname for Mary in the early days, as Sally was used for Sarah and Patsy for Martha. Wayne, Martha and Asa were additional children born after the 1850 census. It is obvious from the 1860 census that the enumerator had some problems with the ages on the 1850 census. John Scalf Sr. (half-brother of William Sr.) also named a daughter Mary and she was called Polly as well. By 1870, Mary “Polly” had probably died and Asa married Malinda ____. Charity Scalf, daughter of William and Susannah Scalf, was born about 1811 according to the 1850 census. Charity married Silas B. Robertson/Roberson (Robinson?). Elmer Scalf states in his book that the name was Robinson (Scalf Family History, page 18). Silas and Charity married June 10, 1833. (Habersham County, Georgia marriages) A Silas Robertson was found in Walker County, Georgia in 1840; however, we cannot be certain that this is the correct Silas Robertson. In his home, there are two males near the same age and either of these could have been Silas, husband of Charity. Charity’s birth date ranges from 1810-1820, if this is Charity Scalf. One of the males also has a birth date in the same range, but the other male was born 1800-1810, which makes it difficult to determine if this was the family of Charity Scalf and Silas Robertson. Several of the Jones families and a Jeremiah Warren are living nearby, which might lend support to this being Silas and Charity since two of her sisters did marry into the Warren family. Charity might have been younger than her age is shown on the 1850 census. It should be noted that Charity is also claimed by the SELF family in their history, but we feel certain that this is Charity SCALF and not SELF. Catherine Scalf, daughter of Ira and Rosanna Gibson Scalf, was also mistaken for Catherine Self. 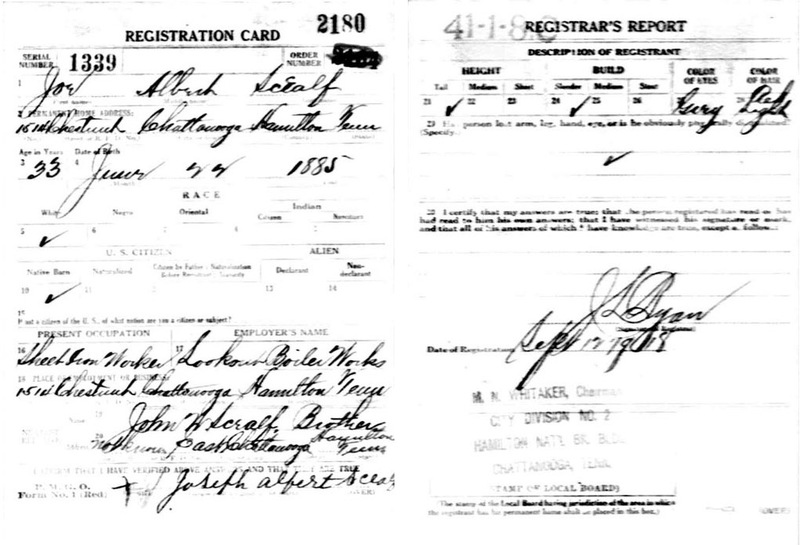 Due to the handwriting of the enumerators, SCALF has often been confused with SELF on census records. By 1850, Silas Robertson and Charity were found in Habersham. As can be seen, the enumerator used initials on this census for the children. Fortunately, he did write the names of Silas and Charity instead of initials. In 1860, we find Silas Robertson and his family in Habersham County, Georgia, but the wife of Silas is Charlotte Robertson. It is possible the full name of Silas Robertson's wife is Charlotte Charity Robertson, but on the other hand, Charity and Charlotte could be two different people. Charity might have died and Silas remarried. Note that Charity stated she was born in Georgia on the 1850 census and Charlotte was born in South Carolina. However, on the 1850 census the both Silas and Charity were born in Georgia and in 1860, Silas and Charlotte were born in South Carolina. Even though the initials in the 1850 census create a problem, there appear to be some similarity between the children in the 1850 and 1860 censuses. In 1870, Silas was born in South Carolina and Charlotte is listed as being born in North Carolina. On the 1880 census, Silas was born in Georgia and Charlotte was born in North Carolina. John Wesley Robertson, son of Silas Robertson and Charity Scalf, was born February 4, 1840 and died July 19, 1924 in Georgia. He is buried at Level Grove Baptist Church Cemetery in Habersham Co. Georgia. John married Sarah Alice “Sally” Sisson. She was born September 8, 1847 and died May 10, 1908. They married February 21, 1867 in Habersham County, Georgia. This family was followed on census records from 1870 through 1910. William T. Robertson, son of John Wesley Robertson and Sarah Alice “Sally” Sisson, was born about 1872 in Georgia. William married Mary R. ______ according to the 1910 census of Habersham County. We have no further information for this family. 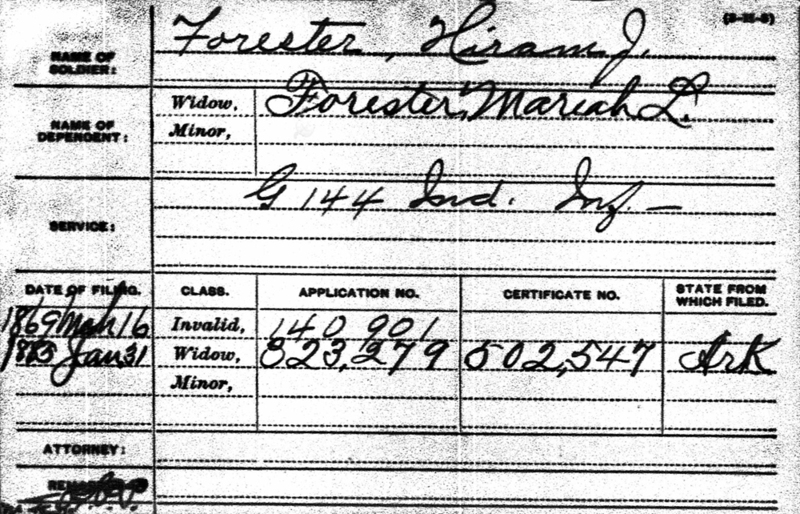 The pension card lists Mariah L. Forester as his widow. The last daughter of William and Susannah Scalf, was unknown to the author until a record was sent from Charles Scealf, a descendant of Albert Lee Scealf. This record reveals that William did have another daughter. This daughter was born 1830 – 1835 and was found on the 1860 Jackson County, Alabama census with her husband, Matthew Tindle/Tindal. Her age listed on this census revealed that she was born about 1829 by estimation, but she was most likely born 1830 –1835 as indicated on the 1840 census. This record confirms that there was a total of six daughters born to William and Susannah Scalf. Although it is stated in this excerpt that Nancy C. Scalf was a daughter of William and Mary, the author believes that this was an error and Charles meant to type William and Susannah instead of William and Mary. Nancy and her husband, Matthew Tindle” were living two houses away from her parents, William (son of Lewis) and Susannah Scalf. Charles Scealf also found a cemetery record from Stewart Cemetery in Alabama listing Matthew Tindle, Nancy Scalf and Lindsey Tindle. These names are found on the 1860 Jackson County, Alabama census. Lindsey was a son of Matthew and Nancy Scalf Tindle. It is mentioned here that William sold the land in 1880. This was most likely William N. Scealf (son of William) who sold the land because his father, William, had died in 1879. Also on this census (1860 Jackson Co. AL), William Warren and his wife Sarah, are living between William Scalf and Matthew Tindle. This William Warren appears to be the son of Charles Warren and Sidney Scalf Warren who were also living in this area. These families were living in the Long Island Community of Jackson County, Alabama in Division #1. In view of this information, it appears that the older daughter in the home of William Scalf (son of Lewis) in 1840 was Miriah Louisa who married Hiram Forrester in 1845. Miriah Louisa is listed as being born 1825 – 1830 on this census and would have been the daughter born next to the youngest daughter, Nancy. She was probably around 19 or 20 when she married and was probably born in Georgia as well. The younger female in the home on the 1830 census would have been Nancy C. Scalf who married Matthew Tindle and Nancy was born in Georgia. Although Elmer Scalf believed Miriah Louisa to be the daughter of Martin Scalf, I find no record that Martin was married until 1839 and I find no children in his home on any of the census records although his wife, Elizabeth Blackburn Scalf, was found with three children after she and Martin separated. Miriah Louisa’s name appears as Loyacy on the transcribed marriage record. Since her middle name was Louisa, the transcriber most likely misinterpreted Louisa as Loyacy instead. Her name might have been Maria Louisa and Miriah could also have been a transcribing error such as Loyacy appears to be, or simply phonetic spelling of the day. One of the girls later named a daughter Maria and this may or may not have been the correct spelling of Miriah’s name. Living next door to William Scalf (son of Lewis) in the 1850 census is the Hiram Forrester family. Miriah’s birth date estimates to be about 1825 on this census. On the 1860 Cass County, Georgia census, Martin Scalf, (son of William and Susannah) is living next door to an H. Forrester and family. An L. Forrester (female) is also listed in the home. This is most likely Hiram and Louisa. The whole family was listed as being born in Georgia. There are three children living in the home by the name of Brightwell. Two of the children appear to be twins. We have no knowledge of who the parents of the Brightwell children were, but they might have been grandchildren of Hiram and Louisa. Louisa stated that she was born in SC on both the 1870 and 1880 census and it is possible she was born in Greenville County, SC shortly before William’s move to Georgia. Hiram Forrester died 1870-1880 and Louisa was a widow in 1880. 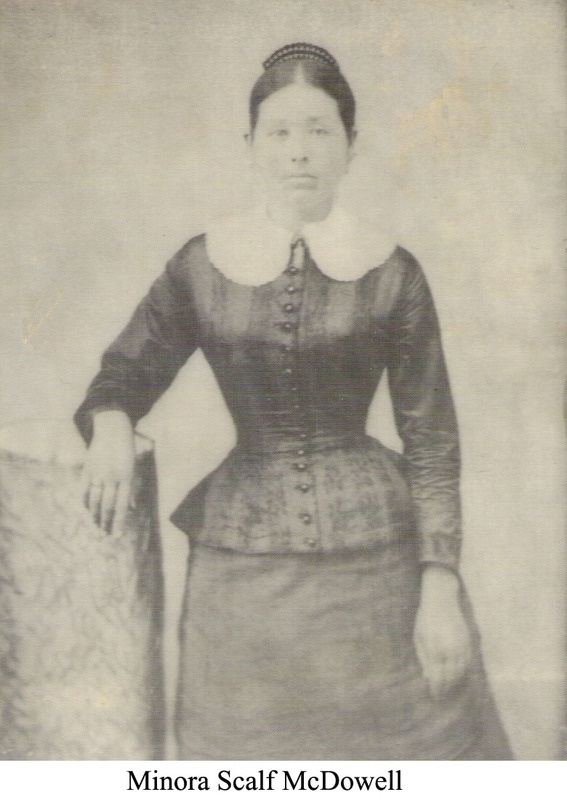 Louisa and her family were still living in Fulton County, Arkansas in 1880, but Miriah Louisa was not found afterwards. The spelling of SCEALF began with the William N. Scealf family and most likely due to the misspellings of enumerators along with other record keepers of that time. William probably pronounced his name SKELF and SCEALF was simply how it was spelled by the folks keeping records and the enumerators. We can only speculate as to how this spelling was acquired; however, the spelling remained with this family throughout the generations, as did the spelling of SCALPH in one of the other family lines. SKELF and SCAFF has also become another spelling of the name. CHILDREN OF WILLIAM SCEALF AND MARY TURNER SCEALF: Compiled from census records, cemetery records and death certificates provided by Charles Scealf, a descendant of this line and Virgil Scalf. William E. Scealf was the first child born in the family of William and Mary Scealf, and Francis Ellen was the next. Both children were born in Georgia. John C. Scealf was the first child to be born in Alabama in 1861, and Albert was the last one born in Alabama in 1867. We believe the family left Alabama sometime around 1868 or 1869 and moved to Dade County, Georgia where William (son of Lewis) died and was buried at State Line Cemetery in Shellmond, Tennessee on the Georgia/Tennessee line. The Civil War was taking place during the years between the births of John C. (1861) and Louis D. Scealf who was born around 1864 according to the census report. Their father, William N. Scealf, might have been a veteran of the Civil War; however, we have not found a record as of this date. The 1880 Dade County census reveals that there were nine living children of William N. and Mary Scealf in 1880. On the 1900 census of Dade County, Mary states she had ten children with only seven living. Three children had died by 1900. The fact that there were nine living children in 1880, suggests that another child was born and died between 1880 and 1900. We know that William Edmond and Frances Ellen died before 1900. Therefore, if another child was born and died 1880-1900, the rest of the children were still living in 1900. We have been able to account for all of the other children with the exception of Amanda J., born about 1873. In reading the Jackson County, Alabama history, it appears that coal mining and railroads were opening up in this area around the time William (son of Lewis) moved there and this may be the reason why William decided to try this area. William must have been quite healthy and strong to have been doing this type of work at 80 years old. William’s son, William N. Scealf had married by this time and his family is also enumerated in the same household with his father. William N. Scealf (son of William) was listed as a “Laborer” as well. Susannah’s age is listed as 77 on this census and is most likely not correct according to other census records. Her birth date estimates to be around 1783 here but all other records indicated 1790-1800 and Charles Scealf states her birth year as 1791. The 1870 census of Dade County, Georgia is actually the first time the name appears with the spelling of SCEALF. William had been listed as SCALF and SCELF with his parents, but now the name takes on a new spelling. I believe this family pronounced the name SKELF and the enumerators of Dade County, Georgia assumed there should be an (A) in this spelling. This spelling has continued to this day for this line of the family. Martin Scalf, brother of William was living next door to William in 1870. However, the enumerator spelled Martin’s name SCALF. This suggests that the enumerators were hearing something different when this name was pronounced by different people. The 1880 census confirms that William SCEALF and Martin SCALF were brothers. 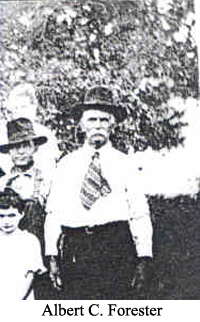 By 1900, William N. Scealf (son of William) and wife Mary are living with their son, Louis D. Scealf, in Dade County, Georgia. William Edmond Scealf, son of William and Mary Turner Scealf, was born about 1855 and died 1888-1900. William married Jane Lambert, although we have no marriage date at this time. 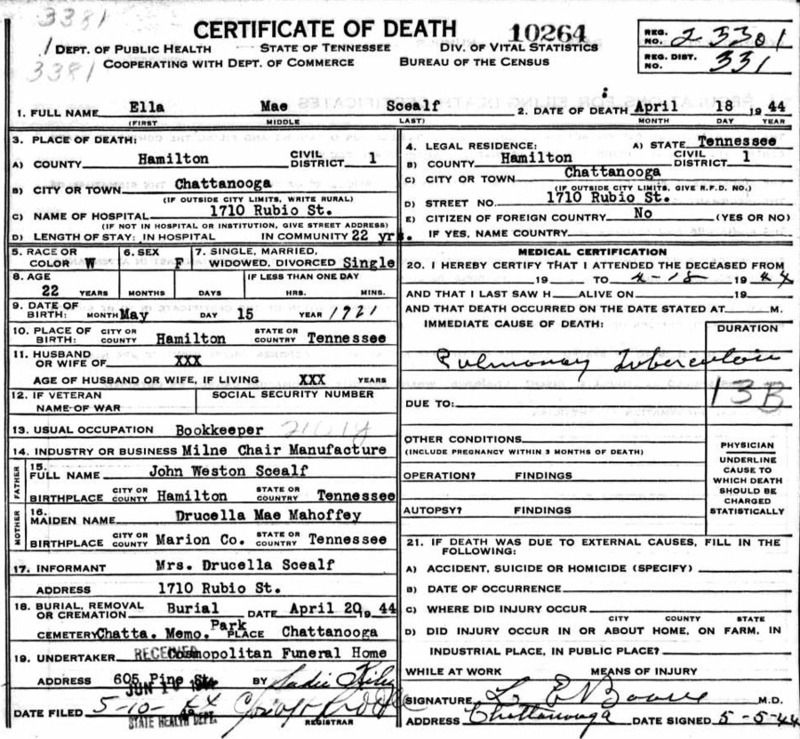 Jane is listed on the death certificate of John W. Scealf as his mother. John W. Scealf, the nephew of Louis Scealf on the 1900 census, and Joe A. Scealf, the nephew of John Scealf on the 1910 and 1920 censuses, appear to be the sons of William Edmond Scealf. Children of William Edmond Scealf and (_? _). 1) Joseph Albert Scealf - born June 1886 and died August 2, 1933. 2) John W. Scealf - born April 1888 (census record). John W. Scealf married Drucilla Mahaffey. 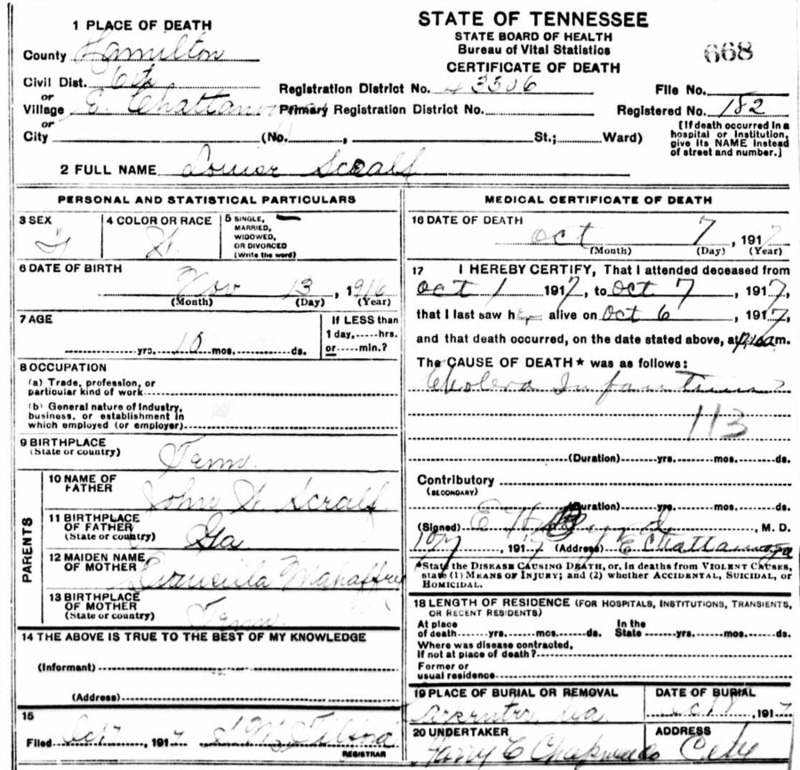 Joseph Scealf, son of William Edmond Scealf and Jane Lambert, was born June 22, 1885 and died August 2, 1933 at Eastern State Hospital in Knoxville, Tennessee from pulmonary tuberculosis. Joe and his brother, John W. Scealf, were raised by their uncles after their father died around 1890. John W. Scealf, aged 39, died yesterday morning at his home on Bragg Street, East Chattanooga. He is survived by his wife, eight children and one brother, J. A. Scealf. Funeral services will be held this afternoon at 2 o’clock from the residence, the Rev. T. J. Smith officiating. Interment will follow in the Chattanooga Memoral park. Pallbearers will be C. B. Young, Earnest, Dave, Walter, Howard and Lawrence Mahaffey. John Weston Scealf married Druscilla Mahaffey. Druscilla was born March 19, 1890 and died December 5, 1974 in Chattanooga, TN. SCEALF – Mrs., Drucilla M., 84, 2303 Stuart St., died Tuesday night in a local hospital. She was the widow of John Weston Scealf and was a member of the Calvary Church of the Nazarene. Survivors are a daughter, Mrs. S. G. Drake of Miami, Fla.; four sons, J. W. Scealf of Bridgeport, Ala.; Lawrence Scealf of Chattanooga; Arnold Scealf and Virgil Scealf, both of Soddy, Tenn.; two brothers, John Mahaffey of Chattanooga and Howard Mahaffey of Cleveland, Tenn.; a sister Mrs. Vera Young of Charleston, S.C.; 18 grandchildren and several nieces and nephews. Funeral services will be 2 p.m. Friday at the Calvary Church of the Nazarene with the Revs. Willard Johnson and P. E. Maples officiating. Interment will be in Chattanooga Memorial Park. Pallbearers will be grandsons, Martin Smith, Robert Scealf, James Sceal Jr., Larry Scealf, Aaron Scealf and Charles Scealf. Honorary pallbearers will be members of the Adult Sunday School Class. The body is at the Chattanooga Funeral Home, East Chapel. In 1900, William and Mary Turner Scealf were living with their son, Louis Scealf. John Weston, son of William Edmond, and a nephew to Louis, was also living in the home. William Father 72 Mar 1828 GA SC SC Married 45 yrs. By 1910, John Weston and Drucilla had married and were living in Marion County, Tennessee. John W. Scealf, the husband of Druscilla Scealf, died March 12, 1926. In 1930, Drucilla had moved to Hamilton County (Chattanooga) Tennessee. Drucilla’s father, Elisha MaHaffey was living in the home. Claude Scealf, son of John W. Scealf Sr. and Drucilla Mahaffey, was born about 1907 according to the 1910 census. We have been unable to find any information concerning Claude after the 1910 census. He was not listed with his parents after this census and might have died young. Lorene Scealf, daughter of John Weston Scealf and Drucilla Mahaffey, was born about 1911 (Census). We have no information on the death date of Lorene; however, we know from the 1940 census that she married _____Drake. The obituary of her sister, Lillie, states she was Mrs. S. G. Drake. We have no further information on Lorene at this time. John W. Scealf, Jr., son of John Weston Scealf, Sr., and Drucilla Mahaffey, was born September 21, 1913 and died March 8, 1993 in Chattanooga, Tennessee. John married Lillye Levera Lawson. She was born 1919 and died March 12, 1998 in Chattanooga, Tennessee. Both John and Lillye are buried at Lakewood Memory Gardens, East. John W. Scealf of Chattanooga died Monday in a local hospital. He was 79. Mr. Scealf, formerly of Bridgeport, Ala., was a longtime Chattanooga resident who was retired from Tennessee Alloy and was a member of St. John’s United Methodist Church. He was a member of the Lions Club, Bridgeport O. F. S. 181 worthy patron of East Chattanooga Lodge O. E. S. 244, the Royal Arch Fidelity Lodge 558, Alhambra Shrine and Scottish Rite, and past member of the Bridgeport PTA. He was preceded in death by his parents, Drucilla and John W. Scealf Sr. and son T. Sgt. Carl E. Scealf. 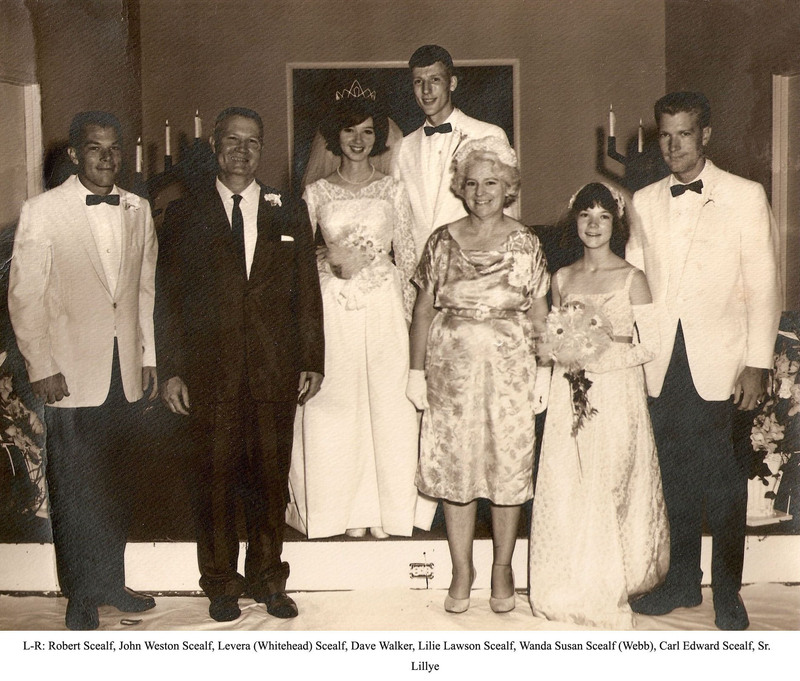 Survivors include his wife, Lillye L. Scealf; two daughters, LeVera Whitehead of Knoxville, and Wanda Webb of South Pittsburg, Tenn.; son, Robert Scealf of Rossville, Ga.; 10 grandchildren; and two great-grandchildren; and three brothers, Virgil and Arnold Scealf of Soddy and Lawrence Scealf of Chattanooga. The funeral will be Wednesday at 1 p.m. at St. John’s United Methodist Church with the Rev. Charles McKinney and the Rev. Jim Harless officiating. Burial will be in Lakewood Memory Gardens. Pallbearers will be Christ. Pickett, Charles Grant, Kenneth Gamble, George Painter, Lannace Coe and Eddie Scealf. The family will receive friends today from 4-9 p.m. at the Highway 58 Chapel of Turner Funeral Home. SCEALF, Lillye Levera, 79, of Harrison, died Tuesday, March 10, 1998, at her home. A member of St. John’s United Methodist Church and the Christian Home Builders Association, she was a former teacher of Balsoria Sunday School class the Bridgeport (Ala.) First Baptist Church. She was past president of the Chattanooga Ostomy Association, North Jackson Hospital Auxiliary and the Norwood Garden Club. A former teacher of Bible at Calvin Donaldson and Orchard Knob Elementary, she was a Cub Scout and Girl Scout leader at East Dale Elementary, past worthy matron of Bridgeport Order of the Eastern Star and the East Chattanooga Order of the Easter Star. She was the widow of J. W. Scealf and the mother of the late Carl Scealf. Survivors include her son, Bob Scealf, Knoxville; two daughters, Levera Whitehead, Knoxville, Wanda Webb, South Pittsburg, Tenn,; four sisters, Mary Sims, Edna Bell, Doris Barnes, Nancy Hawkins; brother, Tommy Lawson; 10 grandchildren, five great-grandchildren. Services will be at 11 a.m. Friday at St. John’s United Methodist Church with the Rev. Randy Martin officiating. Burial will be in Lakewood Memory Gardens, East. Visitation will be 5-9 p.m. today at the Highway 58 Chapel of Turner Funeral Home. SCEALF – T-Sgt. Carl E., age 31, of Rt. 10 Powder Springs Rd., Marietta, Ga., died Saturday morning in South Carolina. He was with the Air Force plant representative for the Lockheed Georgia office and a member of the First Baptist Church of Powder Springs, Ga. He was a native of Chattanooga and former member of the Eastdale Baptist Church. He was also a member of Fidelity Lodge No. 558 F&AM in Chattanooga. Mr. Scealf is survived by his wife, Mrs. Joan Deloach Scealf; three daughters, Misses Carla Ann, Debra Lynn, and Pamala Renee Scealf, all of Marietta, Ga.; one son, Carl T. Scealf Jr. also of Marietta, Ga.; parents, Mr. and Mrs. J. W. Scealf Jr. of Bridgeport, Ala.; two sisters, Mrs. Dave Walker of Ohio and Miss Wanda Scealf of Bridgeport Ala.; brother, Robert S. Scealf, Fort Oglethorpe, Ga.; paternal grandmother, Mrs. J. W. Scealf Sr.; and maternal grandmother, Mrs. S. A. Lawson, both of Chattanooga. Funeral services will be held at 2:30 p.m. Monday at the Eastdale Baptist Church with Rev. W. E. Cosby officiating. Interment will be in Lakewood Memory Gardens East. Pallbearers will be selected from the Air Force. Fidelity Lodge No. 558 F&AM will have charge of graveside services. The body is in the West Chapel of Chattanooga Funeral Home. Lillie L. Scealf, daughter of John Weston Scealf Sr. and Drucilla Mahaffey, was born about 1916 and died June 1956. Lillie married Claude M. Smith. SMITH – Mrs. Lillie Scealf, age 37, 3506 Hoyt St., died in a local hospital late Sunday afternoon. Surviving her are her husband, Claude M. Smith; two daughters, Misses Mildred and Carolyn Smith; one son, Claude Martin Smith, all of Chattanooga; mother, Mrs, Drucilla Scealf, Chattanooga; one sister; Mrs. S. G. Drake, Key Largo, Fla.; four brothers, Lawrence W., Virgil, J. W. Scealf, Chattanooga, and Arnold Scealf, Soddy, Tenn. Also several nieces and nephews. Funeral arrangements will be announced later. Arrangements are by the National Funeral Home.